No more worrying about missing coupons or price changes as you shop - Paribus will give you back any money you missed out on :) Automatically. You know how you buy stuff, and then 3 seconds later find it somewhere else cheaper? Or you forgot to search for a freakin’ coupon? Or, worse – those tricky companies play the “price drop” game on you fully knowing the best time, and amount, to show you ton their site because they have your entire psychological profile on file? Well, a new service that just came out fixes that :) It’s called Paribus.co, and they give you back the money you should have saved from the start. I signed up the second I heard about it, and then hopped on the phone with its founder to learn more (you’ll see my Q&A with him down at the bottom of this Paribus review). Excited to see how much they save me – those companies are gonna lose some profit if this catches on! Stores guarantee money back when prices fall, the only catch is that you have to ask for it (and know when to do so). Paribus does this for you. Every time they find a discrepancy, they will submit a claim on your behalf and then the money owed – 100% of it – goes right back into your accounts. If you never get any money back (which would be shocking, because it would mean you’re either an impeccable shopper or you never buy anything online! ), they don’t take a penny. So pretty much they just give you money for doing nothing :) And unlike my darlings Digit and Acorns that I rave about (sorry, I know I do it a lot but I’m obsessed! ), they’re giving you back *money you already spent* instead of just moving your own money to a different account to help out (like savings account with Digit, and an investment one with Acorns). Because remember, you’re not changing anything about your current shopping behavior – this is all money you already agreed to give the store for item X in return. So it’s like buying a video game at Target, and then them telling you “hey – take $3.00 back, you forgot to use a coupon!” Genius. Is Paribus legit? Yes. Are there cons to Paribus? Of course. You have to give them permission to scan your email. It’s freaky, I know. Here’s a work around though: create a brand new email account and funnel all your shopping through it going forward. It’ll be annoying to set up, but it separates it out from all your other email if you’re concerned. They take 25% of the money they find. Sucky, sure, but also fair, yeah? Businesses don’t make money off of thanks :) And what would you rather have: 75% of free money or 0% of free money? UPDATE: As of 8/29/17 – Paribus is now 100% free and does not take any commissions whatsoever anymore. 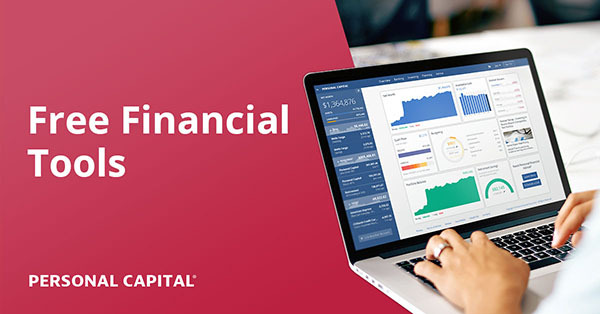 Per their press release, “Now that Paribus is part of Capital One, they are able to provide the same great service without the nominal success fee. You could get lazy and not do your up front research as much. In theory Paribus should catch this and refund your excess money, but I wouldn’t suggest getting into the habit of it. They don’t work with the entire internet. Yet. First off, I can’t believe this hasn’t been made before! What got you and your friend to build it? We felt the pain of getting burned by bad deals too many times, and wanted something for ourselves. It’s a bad feeling when you think you got a deal, only to find out that you paid too much. It’s worse when you’re even promised money back (through low price guarantees), only to find that the promise that’s supposed to protect you is actually incredibly confusing and time consuming to redeem (by design). And when we realized that prices are changing faster and less transparently than ever, it became clear that we as consumers needed some serious help. We’re not sure why it hasn’t been done before, but we’re up to the challenge. 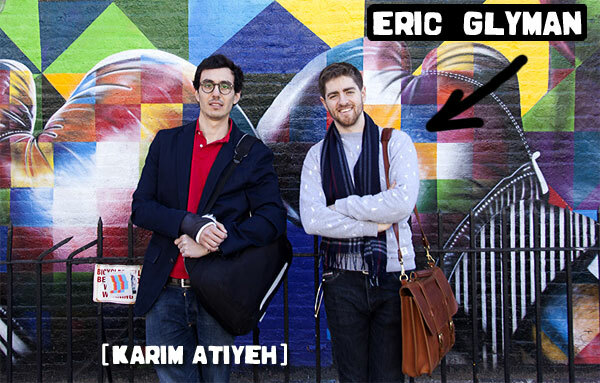 My co-founder Karim and I have been friends for six years. We met in college (Karim has a Master’s in Computer Science and helped teach me some CS too), and we knew we had enough skills to start building. Karim could handle the code and the ins and outs of the loyalty programs, and I could handle the legal/financial/product minutia. We haven’t stopped since. The word itself comes from the latin term Ceteris Paribus (kɛtərɪs pɑːrɪbʊs). My fellow economics/ classics/philosophy/money thinkers out there may recognize it — it’s used when you want to consider how one thing affects one other thing, but do not want to get bogged down thinking about all of the factors involved all at once. A favorite word of great minds like Cicero, John Stuart Mills, Milton Friedman, John Maynard Keynes, etc. We’ve always believed that, at its essence, shopping shouldn’t be more complicated than finding what you need/want, and buying it. The word Paribus captures this. Just buy what you want, and if you miss a better deal (or are taken advantage of), you’ll just get the difference back. Elegant, and no hassle involved. That’s Paribus. What’s the average amount of money users right now are getting back? We’re averaging between $3 and $5 a month. This number can vary a lot depending on how often you shop. Some people have saved $300+ (and one business – $1000+) within 3 months. But for those who don’t shop online all that much, savings won’t be that high — Paribus only helps if you’re making online purchases in the first place. How much have YOU, personally, saved from your own darling creation? But I’ve also used the information (on price changes) that Paribus shows me to save even more with my credit card (See proof below: $192.22). I do most of my online shopping with my Discover card. They have a 90 day price protection policy, so if you buy something, and it drops in price drops after, you can get the difference back from the credit card. Many stores only have 7-14 day price protection coverage periods, but policies at credit cards can extend as long as 3 months. So a lot longer opportunity to get money back. Paribus doesn’t automate getting this money back just yet, but the historical price data we give on all your purchases is definitely enough to file these claims on your own and get some serious cash back. Last year, I saw on Paribus that (i) an office chair, (ii) an iPhone 5s and (iii) a blender I bought had all dropped in price. It had been ~45 days, so the stores wouldn’t cover me, but Discover did! I filled out the paper work and got $192.22 back. There can be a lot of savings in price protection, and its our mission to help you get all of it. Is Paribus safe? The biggest obstacle I see here in wooing new members is the fact you have to attach your personal email to your system. What can you say to all those thinking that right now that would help alleviate a bit of this concern? Or is it a legitimate one? It’s our biggest challenge. And we hope that as our member base grows, we will prove that we’re working day and night to defend our members’ interests. First, Paribus does not live in your inbox. It places webhooks to detect and pull store messages based on sender and subject alone. So, inbox security stays under the supervision of companies that you already trust (e.g., Google and Microsoft). Second, security is embedded through our entire architecture, including dedicated firewalls, VPN services, intrusion prevention systems and stringent access controls. Third, Paribus complies with the Payment Card Industry Data Security Standard (PCI DSS). Complete credit card information is never stored on Paribus servers. And we use Stripe, one of the world’s most secure payment processors, to handle all transactions. Fourth, data is transmitted securely via SSL (TLS 1.2) bank-grade encryption. Any sensitive information stored is encrypted using AES-256 encryption. Lots going on behind the scenes to make sure information is very well protected. Last, I think your reaction is totally on point — we know of many members who have created a brand new email account just for shopping, and linked this account up with Paribus. You’ll get the all the benefits/savings of Paribus, and also separate your shopping activity from all your other personal information. We’ve heard stories before about members getting blacklisted for causing trouble (e.g., returning things way too often, making way too many requests, etc.). The unifying theme among those banned is that they’d somehow violate the rules, make unfair demands of staff, or even commit fraud. Our huge difference — you are explicitly promised price protection by the stores you shop at, and Paribus is simply helping you get what’s promised to you. Nothing excessive, no fraud, nothing unfair. Based on the thousands of data-points we have seen, not a single Paribus member has faced this issue so far. Definitely something we’re monitoring, but we feel strongly that our members are in the right here. Besides, if stores get to change 80 million prices a day, we think its only fair that you have strong technology on your side too. Most of us do our shopping online, so you’ve got a bulk of our transactions covered. Is the plan forward to extend into physical stores too? What other upgrades do you guys envision rolling out? Still a ways away, but that’s a major goal. Something like 90% of shopping in the U.S. happens offline. Next steps on the roadmap include rolling out a native iOS app (Summer 2015), adding support for more stores, and automating credit card price protection. Be there soon! What’s been the coolest part of the ride so far? Honestly, the journey of going from an idea, to releasing a product with actual value. It works, it saves real money, and it feels good to be able to contribute something useful. 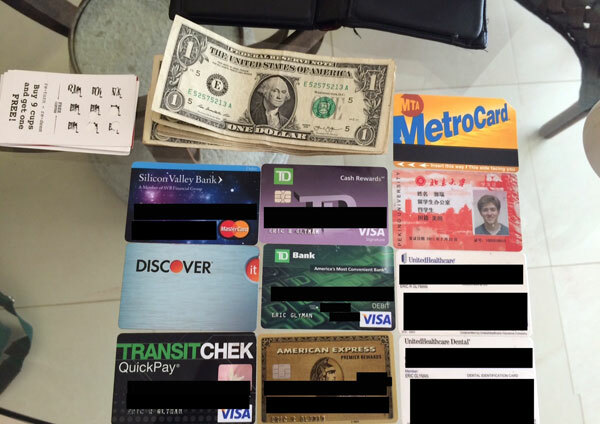 Lastly, what’s in your wallet right now? What do you think? Awesome? Lame? Gonna sign up and try it out? I think that’s the best part of it all – you don’t have to change a thing about your habits. Just keep shopping as you normally do (which hopefully isn’t that much!) and then watch clumps of money get returned as their algorithm does it’s thing in the background… My type of service! Let me know if anyone tries it out, and how much $$$ you get back… This could be a game changer. 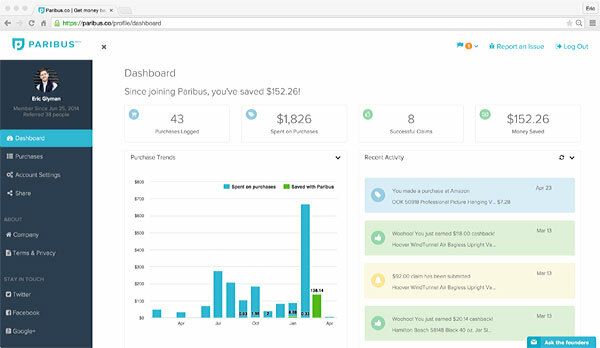 UPDATE: Paribus was just acquired by Capital One!!! PLEASE NOTE: As with most in-depth reviews I spend my time sharing with you all here, I get paid a referral commission for anyone who signs up and saves. In this case it’s $5.00 as you can see above, and anyone else who signs up will also get this refer-a-friend opportunity as well. Regular readers know I would never pimp out anything I don’t love or use myself here, and this post would have been written regardless of money. Please don’t ever sign up to something you don’t trust! I wonder if Amazon re-sellers can use this service. A lot of them use sites like shoprunner to buy stuff to re-sell (although I think they frown on this), but then you could also look to make money on the back end if there’s a price drop! I don’t buy enough online though so I don’t think it’s for me. Seriously, it’s like once every couple months. Money not spent is money saved! Interesting about re-sellers! I don’t know much about that world but I’ll see if I can get Eric to comment on that one. 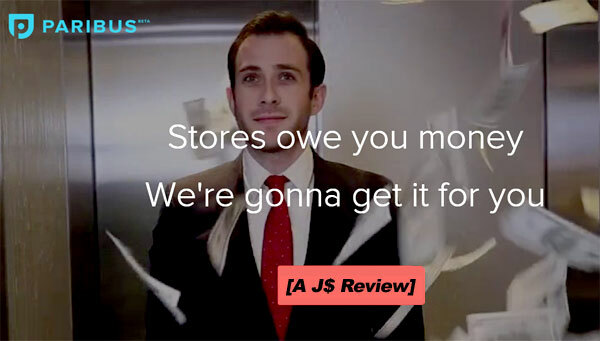 You’re on point with your point on re-sellers — many have already found out about us (though have to say, J$ was surprisingly early in his discovery!). At the heart of it, these guys are bulk buyers. Price drops affect everyone, even if you intend to re-sell the item later. Sound pretty cool, just don’t think I buy enough online to be useful for me, but for those who do sound like a nice app. I think this is a very good service! I’m just wondering if this Paribus.co can be use worldwide? I don’t shop much online until the holidays, then October, November, and December – watch out! I will definitely sign up before I start my seasonal shopping. Looking forward to the savings this year. Thanks, Paribus! And, thank you, J. Money, for introducing this great app! Thanks, Debby! Look forward to seeing/helping you for the holidays! I hate shopping for deals, so this is the App for me! Paribus- please hook us up with Home Depot and Lowes next! We aim to please, Hannah! And appreciate the quick feedback too — will be adding these to our product roadmap. Wow, this is a great app. I don’t do much online shopping (I don’t do much shopping at all…I kind of hate it). But this will be great for a lot of my friends! I’ll pass the word along. Thanks! This looks pretty good. I hate in person shopping, so do it all online, and I’m sure amazon has my price tolerances pegged. Signed up! It will be nice having this run in the background because I’m always buying stuff from Amazon and worry about hitting the price at the right time! I was intrigued enough to click through to the article, but the frequent use of winky and smileys in this article just turned me off. Think there can be a place for those, but they felt really out of place and unprofessional here. Completely the opposite for me- your tone is spot on and feels REAL compared to just your standard ad/sponsored post. Thanks Keely – appreciate that! any of the links in the article above that mention Paribus is attached to my referral link, so feel free to click through those. I’m really glad you like it enough to try out! AWESOME concept. I love it. I basically never buy anything online, only if I can get an online deal that isn’t offered in the store, but I think I’m going to sign up for it as a just-in-case thing. Even if it saves me nothing it also cost me nothing, right. Can’t wait to see the possible upgrades that they can make to the concept. I do most of my purchases online so this seems perfect. Hoping for the best! Cool app! My husband and I can get really irked over scenarios where something goes on sale after we buy it. For some reason that gets under our skin. The Walmart price-matching app is also pretty slick (for in-store shopping). This seems like a dumb question and something I just missed in the article, but I’m going to ask anyways. Do I only have to give them access to my email that is used for online shopping? Or do they have access to my bank account (cc transactions) as well? How do you get the money back if they don’t have access to your bank account? 1. 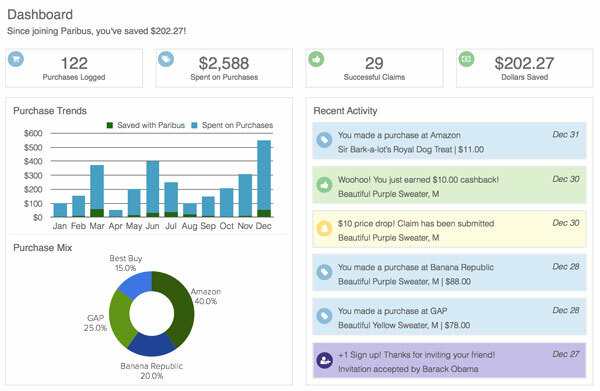 Paribus detects purchases from e-receipts sent to the email that you join with. And for stores that don’t send itemized receipts (Amazon), we’ve built a way for you to add credentials so these itemized purchases can be tracked too. If there’s no e-receipt to tie the purchase with, the item isn’t tracked. 2. Paribus does not have access to your bank account or CC transactions. The key reason Paribus requests a card is to be able to charge/earn our success fee for saving you money! If we don’t save you money first, you’ll never be charged. When Paribus engages successfully on your behalf and a store issues you a price adjustment, you will typically receive that price adjustment in the form of the store refunding money directly into your original form of payment with the store. For example, if you originally paid with a debit card, you should receive a credit for the amount of the refund on that debit card. The store, and not Paribus, issues the full refund. That is new to me! I had never heard about them. I wonder whether it works worldwide or only in the US? You got me interested, I have to do some more research :) Thanks for sharing this, I appreciate it! I buy basically everything on Amazon except groceries. This seems perfect for me. Thanks for the heads up! I will sign up for sure. Love Amazon, but they are rather sneaky with watching what I buy and for how much. Thanks for creating this and I look forward to being a part of your growth! Definitely going to try this! I don’t shop much, but I do get a lot of things on Amazon, so even if it’s just a few bucks back it’s better than nothing! Thanks for the info! I just signed up. The process to sign up is easy. I can’t wait to see how the claim work and how much I will be getting back. The sign up was a little strange and I have made purchases on amazon in last 30 days but does not indicate anything, not sure what is happening. I make plenty of amazon purchases so should help out. Hopefully I emailed them and stuff will get straightened out, or it just works on future sales not the past 30 days. Either way hopefully comes out well for everyone. Maybe it takes a little bit to aggregate or something? Lemme know if you don’t hear back from them in a few days – I’ll ping ’em for you. Apologies for the hassle — looks like we were having a minor hiccup on the server, but should be resolved. I think my co-founder, Karim, was in touch, though please do let us know if anything else comes up. Great to have you onboard! Yes, they did get back and it is connected and finding the purchases. Great support, good sign of things to come, now just hoping for a catch on an amazon purchase. I agreed, why the heck has no one done this sooner?! If they can get the logistics sorted out and partner with more retailers (and countries..*cough* Canada *cough*) they could make a killing! Earlier this year I managed to save myself $900+ because I just happened to be browsing the retailer’s website and noticed the brand new (very expensive; don’t judge! lol) bike I just purchased was suddenly %25 off! Fortunately, I saw that during the 30-day price drop period and soon after got a nice refund on my credit card. That’s a phenomenal story! Great to hear that you didn’t let the retailer get away with it. That’s one way to make awesome deals even awesomer! :) I’m going to try it. J$! Question: Does this work if you purchase something through cashback sites like Ebates or FatWallet? Founder @Paribus here. It works no matter where or how you make your purchase. 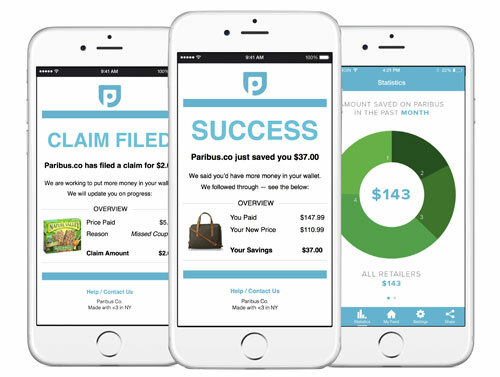 As long as you 1) Make a purchase from one of the supported stores (listed here: https://paribus.co/merchants ) and 2) Have the e-receipt delivered to the email that you sign-up to Paribus with, then you should be all set. Great to have you onboard, and always feel free to get in touch! I signed up but have a quick question….if I delete shopping emails, will Paribus still be able to access it in my trash folder? I’m OCD about my inbox…how long do I need to keep shopping emails in there for Paribus? Thanks! Hi Heather. Karim from the Paribus team here. Paribus will not be able to detect purchases in your “Trash” folder but quickly detect new purchases as they come in (usually within a few minutes, sometimes within the hour, but this can sometimes take a little longer in rare cases depending on GMail’s servers). 1) If you delete your receipts and shipping confirmation at the end of the day, you should be fine. 2) If you decide to move a few receipts back to the inbox, you can shoot us an email at [email protected] and we’ll trigger a re-sync to pull them for you. 3) You can set-up automatic filters to put all receipts (or emails from @amazon.com, @jcrew.com etc.) in a “Receipts” folder so that you don’t ever have to see them. this doesnt frighten you though? and im one of those straight up resellers, and the service itself seems amazing, but to give someone access to my email with such power does seem scary. You can always use a separate/new email for purchases and attach it to that one :) Then you’d avoid all the spam email too that comes with buying stuff online – hah! I understand that it scans receipts from your inbox, but if you usually delete receipts and put it in the trash, does it scan your trashcan for receipts too? Otherwise I’ll have to dog out those receipts so that paribus can do its thing. Thanks for the reply. Is there an a\Android app??? Not yet I don’t believe. They did just release an iPhone app though. What if your purchase is made with a gift card? I often will stock up on Amazon gift cards now while I can earn 5-10% cashback with a credit card & then use that balance for purchases. is this for mobile only as an app or it work in desktops? Both. I’ve actually never used the app before myself. Do you know if Paribus will work w/ Amazon Prime Pantry. I can see how prices change a lot w/ dry goods (paper towels, lysol, etc.) and how paribus would handle that sub-service of Amazon. Just got confirmation that they include Prime Pantry purchases. Thanks for coming back to let us know! Just installed the app and went into my feed and saw a lot of amazon purchases I made. I noticed in the upper right in most of the purchases it had the word ineligible. When I clicked on that it stated that this item did not fall under amazons price match plan, or something to that regard. I do most shopping on amazon, so should I expect most of my purchases through there, via my prime account, to wind up being ineligible for price match? Eligibility is a quick and easy system for us to show you a store’s policy on price reduction refunds. If you go to the dashboard and scroll over the merchant icon of the purchase, you can read the store’s policy and see whether that purchase is eligible for a refund or not. As a quick summary, items labeled as ‘eligible’ are covered by a store’s price protection policy — when prices drop during this period, Paribus will automatically file claims to get you money back. Items labeled as ‘maybe’ are no longer covered by the original store of purchase, but may be covered by your credit card provider. Items that are ‘ineligible’ are not eligible for money back. I wouldn’t worry about this feature too much, if you can get a refund out of an order, Paribus will do all the heavy lifting for you automatically! Just sit back, relax and enjoy the savings on autopilot. Is there a process to withdraw from this service if I find it is not worth while? To delete your account, you can visit your profile at http://www.paribus.co, go to ‘Account Settings’, ‘Profile’, and then click on ‘Delete Paribus Account’ under your profile picture. We’re so sorry to see you go. It is unfortunate you want to leave us already, but to help improve our user experience do you have any feedback on what we could have done better? I just signed up. How can none of my purchases be eligible? Staples and Amazon are on the list. Why or What am I doing wrong…? Also, does Amazon.Smile work as one of your merchants…? Is there an Android app out there or what? they’re only on Apple right now, but they plan on releasing their Android app over the next two months or so. I know you’ve mentioned people deleting order confirms and that by doing so it won’t work. What about if you keep it as new but move it to another folder within your mail? I keep all my receipts in one folder for tracking. Also, I just signed up and it is not registering any of my purchases. This might be because I use the old school aol. Yes I am a diehard aol user and I’m 32-they got me hooked in my pre-teen years! As long as they are still in your inbox (or in subfolders) you should be all set! Did you make sure to link your Amazon Account as well? How does Paribus calculate when to ask the retailer for a partial refund? Is there a formula for how much money / what percentage of the cost, before Paribus asks for the refund? I’ve had several claims / refunds — and yay! The refunds are between $1 – $3 each. I currently see that I have a $0.30 price drop on an eligible item, but no claim submitted. What threshold must be met for the claim to be submitted? I have my own domain and email hosted with Rackspace and it says my email provider is not currently supported. Is this due to my custom domain or the fact that rackspace hosted emails are not supported? And is there any plan to support this in the future? So i have ordered stuff online for years from amazon but have deleted there receipits that have come to my emails do they go into your amazon account and see if they can save you money ? Would Paribus work if I paid with Amazon giftcards? I purchased something from Amazon and it said eligibility ended 22 days ago but I only purchased it 6 days ago. Am I missing something on how this app works? Why would the service need to delete or send emails? That’s what’s keeping me from signing up from the service. I don’t want any of my e-mails deleted. And what about general correspondence of a personal nature? If Paribus can figure out a way to make this work with airline tickets purchased online they’ll make billions. When will you be coming to Canada? PARIBUS wants permission to read and MANAGE my emails? Are they serious? I read some comments on their Facebook page. 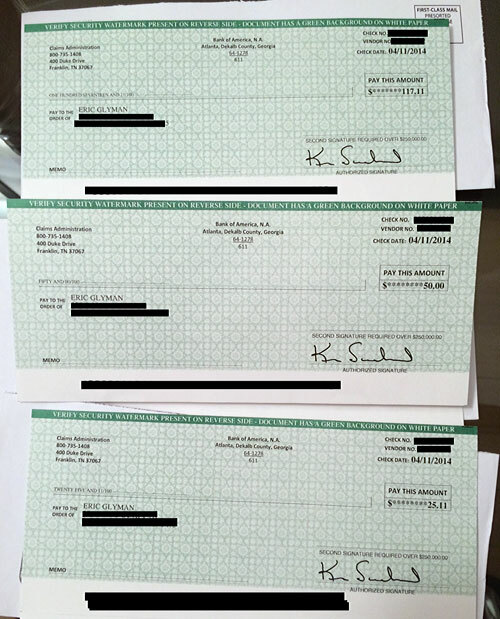 One individual said that Paribus posted a comment in their name that she got $119 back. She NEVER wrote addduch a comment! And the CEO has a BA in EAST ASIAN STUDIES. REALLY? Come on, this company is terrible. Nothing but bad comments.